(*) Includes TERM Indicator 18 – Expenditure for personal mobility per person by income group. Pricing policies can encourage behavioural changes towards environmentally less damaging and safer forms of transport. Prices can also influence demand and efficiency by ensuring that users pay the full cost of transport. The European Commission is committed to developing a fair and efficient Community pricing system. The objectives are described in the Commission White Paper ‘The Future Development of the Common Transport Policy’ (CEC, 1992) and the Green Paper ‘Towards Fair and Efficient Pricing in Transport’ (CEC, 1995). These argue that taxation should be used to ensure that all external costs, such as air pollution, accidents, noise and congestion, are covered in the prices paid by the user. The fair and efficient pricing policy relies on taxes on road transport fuels (CEC, 1998a) and charges for road use (CEC, 1998c). It also proposes that taxes and charges should be used to differentiate prices across ‘time, space and modes’ (CEC, 1998d). An example of this is the ‘Eurovignette Directive’ (CEC, 1998b), dealing with charges and taxes for heavy-goods vehicles, and classifying heavy-goods vehicles in accordance with their environmental impacts. The implementation of the fair and efficient pricing policy, however, faces many difficulties. In the Commission’s White Paper on ‘Fair Payment for Infrastructure Use’ (CEC, 1997b), a phased approach to a common transport infrastructure charging framework was proposed, but this met many obstacles. In its 1998-2004 work programme, the Commission announced that it will take the necessary steps to launch the first phase of the programme to apply progressively the principle of charging for marginal social costs. Data from the United Kingdom and Denmark shows that the total costs of car transport (including purchase, maintenance, insurance, taxes and fuel use) have remained fairly constant in real terms since the 1980s. Moreover, the perceived marginal cost (i.e. real fuel price), which often governs decisions on car use, has fallen in some countries. 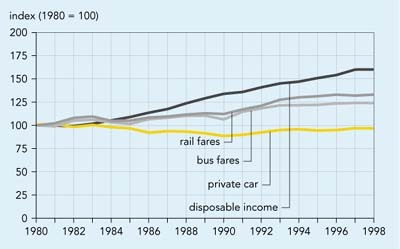 By contrast, the costs of public transport have increased at a faster rate than those of car transport. Changes in prices have therefore encouraged private car use rather than public transport. Currently there is little consistency in fuel price and tax policies across the EU. The external costs of transport in the EU caused by environmental damage (noise, local air pollution, climate change) and accidents are estimated at around 4 % of GDP. This excludes the costs of infrastructure wear and tear, congestion and some other environmental damage. Although methodological and data problems remain, the current internalisation of infrastructure and environmental costs is estimated to cover only about 30 % of external costs for road and 39 % for rail. This shows that even when taxes are included transport revenues still do not cover all external costs. Harmonised data on taxes (apart from fuel taxes) and other charges is not available. As well as considering the effects of taxation on demand, it is important to consider the effects of subsidies. At present, data on subsidies is not collected in a way that enables an EU-wide indicator to be developed. Such an indicator is needed as there are believed to be wide variations in subsidy policy and level across the EU. For references, please go to https://www.eea.europa.eu/publications/ENVISSUENo12/page022.html or scan the QR code.